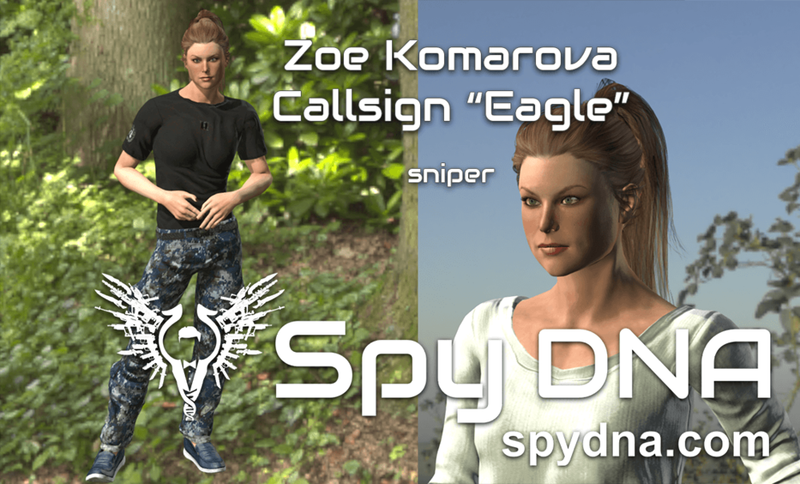 A former scout sniper, Zoe was very difficult for the Agency to recruit. Her unblemished record and 81 confirmed kills meant that her previous employer did not want to let her go, as she was considered to be elite at her trade. Luckily, the Agency was able to make a compelling offer, which in turn allowed Zoe to take her trade to the next level with the genetic enhancements Dr. Crotalus synthesized for her. Zoe worked with Ivan to get comfortable with the new gauss sniper rifles and is considered, without question, the best marksman at the Agency. Unlike most of the team, Zoe is very fluid in the weapons she employs. While she considers close range the “unnecessary hazard”, she is a crack shot at any range, with pistols and assault rifles as well as sniper rifles. For extreme range engagements (1km or more) she typically takes the SR-100, a precision 10mm sniper rifle. However, when the range is merely “long” she prefers the gauss dart rifles (SRG-29 & SRG-20) which have lower recoil and allow for more rapid engagement of multiple targets. Zoe has developed a strong dislike of the R-16 and R-20 which she refers to as “junk rifles” for their lack of accuracy. Zoe is the anti-social member of the team. When not on mission she mostly keeps to herself. When she must socialize, you usually find her with Rostam or Ivan. She shows some signs of resentment towards Nuri. Objectively, she is cold, calculating, and professional. Things either aid the objective or they are a waste of time. Quote: What do you need me for? If it’s closer than 200m, even Karsten can hit that.